From a full packing service to simply supplying the boxes, we can offer a packing service to suit your needs. 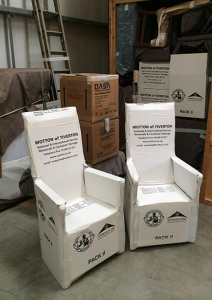 You can be assured that with 40 years of experience in packing and moving we understand the need to use durable good quality packing materials. We understand that moving home can be time-consuming, so we offer a full-pack service where our expert and fully trained removal team will pack for you. Our team handles everything for you. If it’s just your valuables and fragile items you would like some help with, our part-pack service could be for you. Our removal team will pack all the valuable and fragile items for you, leaving you to pack the rest. We will happily offer you some guidance on the best and quickest methods. To keep the costs of moving to a minimum, you can pack your possessions yourself. We will provide you with several sizes of boxes, tape, paper and wardrobe cartons to assist your packing. If you have particularly valuable items, or if you are shipping your possessions overseas, we highly recommend using our export packing service. When we visit to provide a quote we may identify some items that would be best treated in this manner. We use extra packaging for all items, including bubble blankets, card and wrap to ensure your goods are well protected for the journey. Antique and fine art items can carry a high financial value and often even higher sentimental value, so we understand how important it is that they are handled with care during a property move. We use extra packaging and offer a bespoke crating service to ensure that your individual items of artwork are completely protected. Our expert master packers are fully trained, so your items will be handled and secured with the utmost care and attention during transportation.